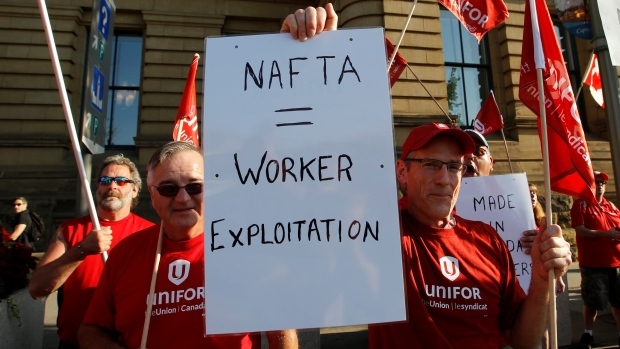 (Reuters) The head of Canada’s biggest private-sector union headed to Mexico’s Senate on Friday, promising to fight at the NAFTA trade pact talks for improved Mexican wages and free collective bargaining as a way of benefiting workers across North America. The issue of tougher labor standards has emerged as a key sticking point in the talks to update the North American Free Trade Agreement, and has brought disparate groups of workers from across the region closer to U.S. populists. "There will not be an agreement" until the Mexican team agrees to free collective bargaining, the elimination of so-called yellow unions that are dominated by employers, and fair wages for Mexican workers, Unifor President Jerry Dias said. The event held in a side chamber of the Senate was organized by the umbrella organization Better Without Free Trade Agreements, which represents dozens of social organizations and unions. Dias argued that low wages have not only hurt Mexican workers but have also prompted manufacturing jobs in Canada and the United States to leave for Mexico. By including much tougher labor standards in an updated NAFTA, the issue could be dealt with head on, he said. "When you start talking about low wages, we can deal with that under the dispute mechanism as an unfair subsidy." The fifth round of talks NAFTA is being held in the upscale Camino Real hotel in Mexico City. "What Mexico offers in this negotiation and to the rest of the world is cheap labor. That’s what Mexico puts on the table and how it presents itself as an attractive place for investments," Senator Mario Delgado of the leftist Party of the Democratic Revolution told Reuters. "It is a shame and it is unsustainable for Mexico. ... Our salary policy is putting at risk the existence of the treaty," said Delgado. Given Mexico’s higher inflation rates, wages are now lower there in real terms than when NAFTA took effect, according to a report published in August by credit rating agency Moody’s. While formally employed workers earn significantly more, the statutory minimum wage is a mere 80 pesos ($4.23) a day.